Totally Together Reviews: HP TouchSmart Computer Review and Give-Away! HP TouchSmart Computer Review and Give-Away! The contest is now over. Thank you to all who entered! The winner has been notified via email. I hope to have more fun reviews and give-aways posted in the upcoming year. this is a compensated review by BlogHer and HP. Have you seen one of these? I had not, until one arrived on my doorstep last week, but now I am seeing the ads everywhere---it must be like when you’re looking for a new car and suddenly the car you’ve decided to look into is all over the place. --ONE plug. That’s it! and no computer tower, which I love. It’s so clean-looking! 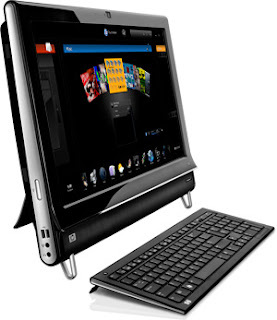 If you’d like more information about all the bells and whistles the HP TouchSmart 600 offers, here is the official information from HP’s website. We’ve decided to put our brand new HP TouchSmart 600 in the kids’ playroom/homework room, where my everyday desktop currently lives (in an armoire. because it’s ugly.) I love how slim the monitor is, and that I can easily move it back towards the end of the homework table when the kids are doing their homework. As of right now, we are mostly using the Touch Smart as a way for the girls to access the Internet (limited thus far to starfall.com and poptropica.com) and to play chess. The already-loaded HP chess game is fantastic-- I’ve never seen a better computerized chess tutor. Adam is excited to learn more about the photo organization software (included) and the music library (included). I’m excited that he and the girls are so excited and are spending so much time playing together and fooling around with all of the programs. Thank you so much, HP, for bringing Christmas to our home a bit early. This is a wonderful family gift. HP has generously agreed to give away the exact same Touch Smart to one of my readers, and I’m so happy to share this fantastic prize with one other lucky person/family. To enter, please leave a comment below and tell me and HP how a new TouchSmart 600 would benefit you and your family. Please leave a valid email address (okay to write in DOT COM code. I’m going to delete all comments once a winner is picked, and am not sharing your email addresses with anyone at either HP or BlogHer). I promise. Please see the official rules here. There are other opportunities to win at BlogHer.com, so make sure to enter all the contests! The contest will run until December 24, 2009 at 5pm pacific. Thank you so much for your entries, and good luck! Gluten-Free Almond Flour Cookbook Give-Away! Tassimo Hot Beverage System Review and Give-Away! $5 Dinner Mom Cook Book Give-Away!